Sail from Vancouver around the beautiful islands of Hawaii where you can see rugged cliff formations jutting out over the ocean, stunning waterfalls, and even an active volcano. Don't forget to practice your hula on the way! Dreaming of a Pacific cruise? Look no further than Royal Caribbean International’s Radiance of the Seas ship®, offering great Alaska and Australia cruises along with promotions and discounts. Anticipate sweeping ocean vistas and unforgettable vacation moments when you choose Radiance of the Seas. 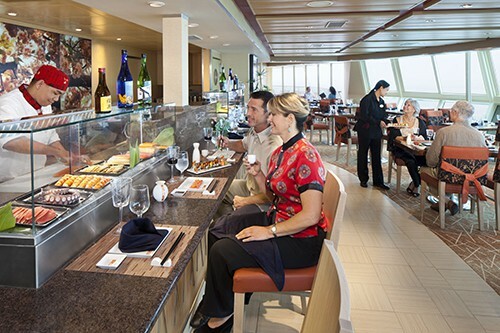 Your at-sea experience combines innovative entertainment, panoramic vistas, and a wide variety of delicious dining options. Acres of glass enclose the nine-story central atrium and panoramic windows ensure you'll never be at a loss for an incredible view. Choose from the newest dining experience options, from casual restaurants and family-style Italian fare to South American eats. Children’s entertainment is customized and complimentary through Royal Caribbean’s Royal Babies & Tots® and Adventure Ocean® Youth Programs. Radiance of the Seas also features VIP guest lounges, an outdoor poolside movie screen showing first-run movies day and night, and duty-free shopping. Whether you seek adventure, relaxation, or fine fare, Radiance of the Seas has features to please every taste. This suite has a a 66 sq. ft. balcony, includes two convertible twin beds and a sofa bed to sleep up to a total of four guests. Features your own private 43 sq. ft. balcony. These rooms include a sitting area with sofa, two twin beds that can convert to a Royal King-size. Balcony Staterooms are equipped with a minibar, sitting area, and an extendable working surface for laptop computers. These staterooms feature a spectacular view through your own stateroom window and include a sitting area with sofa, minibar, and an extendable working surface for laptops. Rooms equipped with Pullman-style beds can sleep up to four guests. These staterooms include a sitting area with sofa, minibar and an extendable working surface for laptops. Rooms equipped with Pullman-style beds can sleep up to three or four guests. Recharge your mind and body at the Vitality Spa by enjoying an extensive menu of luxiry spa treatments including acupuncture by spa specialists. Afterward, take a dip in one of three pools onboard including the adults-only Solarium retreat. Prefer a more active cruise experience? Give a tai chi and yoga class a try at the state-of-the art Fitness Center or shoot some hoops at the basketball court. 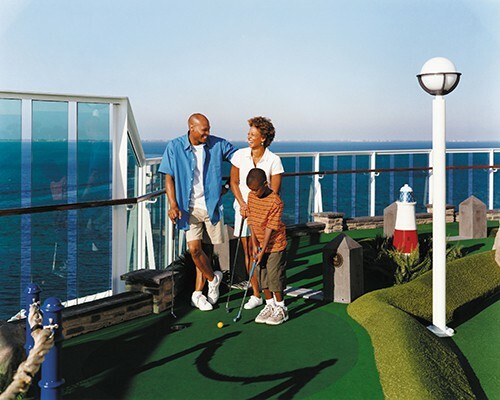 Test your rock climbing skills over at the rock-climbing wall or play a game on the green at the mini-golf course. When the sun sets, be sure not to miss exciting Broadway-style shows at the Main Theater and top the night off by trying your luck at the dazzling 6,459 sq. ft. Vegas-style Casino Royale featuring 188 slot machines and 11 gaming tables. 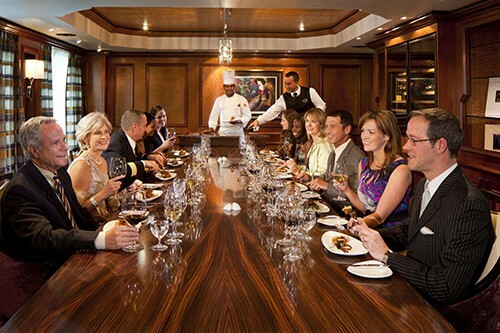 Enjoy multi-course dining options serving wide a variety of menu options at the ship’s main dining rooms as well as upscale specialty restaurants like Chef’s Table, sure to suit any taste.